If you are looking for easy ways to alkalize your body, this guide is for you. Research shows that the health and well-being of the human body is related to its pH level. Most people consume a diet of acid-producing food components such as sugars, meat and grains. But there is less emphasis on alkaline foods that can balance the above. This results in an imbalance in the body leading to inertia, fatigue, indigestion and headaches among others. Even if you are leading a busy lifestyle and have limited control over your food choices, there are easy ways to alkalize your food. This is one of the classical methods to alkalize your body, recommended over the years. Early in the morning, the body is prone to be more acidic. Hence, it is important to alkalize your food early in the morning to restore the balance. Before you pick up your first cup of black coffee, you should have an alkaline drink to begin the day. A glass of warm water with lemon juice is a simple way to alkalize your body. You can also try some other variations – add a spoonful of honey to the lime juice and water. Or you can add a dash of ginger to the mix.Any of these easy ways help you alkalize your body and maintain the balance of acid and base the entire day. Another easy way to alkalize your body is to increase your consumption of apple cider vinegar. Besides controlling the acid levels, apple cider vinegar is also said to destroy pathogens, lower sugar levels and help control body weight. This vinegar has a peculiar taste. If you are comfortable, you can consume it straight. The other option is to add the apple cider vinegar to your lemon juice recipe or mix it up with some molasses or honey. Choose organically grown greens such as spinach, kale and cabbage. Also eat plenty of lettuce. Include sprouts and grasses as well. These provide your body with vitamins, minerals and amino acids. Here is a great recipe to alkalize your body: 2 cups mixed green vegetables, 1 cup chopped carrots, celery, cabbage and other cruciferous veggies, ½ cup canned or boiled chickpeas, 2 tbsp sunflower seeds, ¼ cup quinoa, olive oil and lemon juice. Mix these up, season to taste with salt and pepper and enjoy! Drink lots of water- at least 8 to 10 glasses per day. Also drink water infused with lemon juice and cucumber slices. These ingredients make the water alkaline. 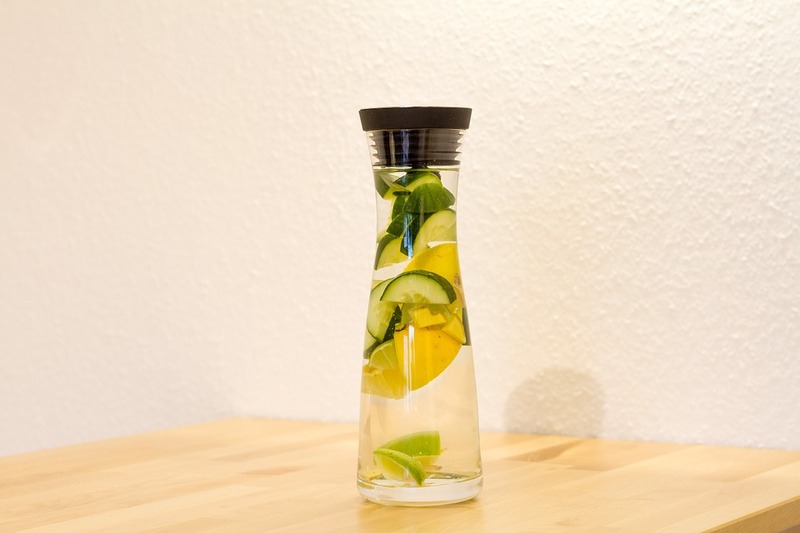 Slice a cucumber and quarter a lemon; add the pieces to a pitcher of water. Throw in some chopped mint leaves. Let the mixture infuse for 8-10 hours in the refrigerator. Drink this alkaline water first thing on an empty stomach. This is a wonderful and easy way to alkalize your body. Baking soda is alkaline in nature, so drinking a glass of water mixed with a teaspoon of baking soda two to three time a day is an easy way to alkalize the body. However, baking soda may increase your blood pressure, so consume it with caution. Another easy way to alkalize your body fast is to avoid beverages containing caffeine, alcohol as well as soda, sugar, aspartame, and other artificial sweeteners. Stay away from preservatives, artificial food colorings and flavorings. Say no to animal foods- red meat is highly acidic. So if you are looking to alkalize your body you must try to maintain a vegetarian diet. If you must, consume only lean meat. At all costs, avoid pork which is difficult to digest and adds to your body’s toxic overload. Stay away from fried foods with vegetable and corn oils. These add to the inflammation and make your body acidic. An easy way to alkalize a body fast is to consume only raw foods (food closest to its natural state) as this keeps the body alkaline. Cooking foods increases their acidity. If you are not too fond of raw foods, go for blanched meals. Aim to get in at least 80% of fruits, vegetables and sprouts along with green leafy vegetables and ocean vegetables for these 3 days. Here is an easy alkalizing juice recipe: Blend together 8 fluid oz. of tomato juice with 1 tsp wheat germ, 1 tbsp Brewer’s yeast and Lecithin daily.This is an easy juice recipe to keep your body alkaline. You might ask, ‘what does exercise have to do with alkalinity of the body?’ The answer is everything. When you exercise, you sweat and your body throws out toxic waste from the skin pores while encouraging detoxification of acids. Exercise also keeps your kidneys, lungs, liver, bowel and lymphatic system functioning properly. Late nights cause stress on the body making it acidic. Try to get in at least 7-8 hours of sleep every day. Chewing your food slowly and mindfully helps in better digestion. This allows the body to absorb all the nutrients and helps create a healthy body and mind. Eat smaller portions and stop eating when you are full. Smoking adds to the body’s toxic overload. So quit today! Related content: Easy ways to quit smoking. Many foods like nuts and whole grains are classified as acidic. However, it is not the best thing to eliminate them completely from your diet as they contain a lot of other goodness. Likewise, milk is considered a neutral food (neither acid nor alkaline) but that does not mean it is suitable for everyone. Avoid milk if you are unable to digest it properly. You can switch to almond milk, rice or soy milk instead. How long it takes to alkalize your body depends on many factors like your age, lifestyle, diet and your existing toxic overload. I hope the above easy ways to alkalize your body help you lead a healthier lifestyle.